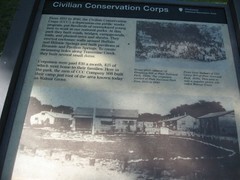 This historical monument is a gift honoring the young men of Civilian Conservation Corps Company 808 who contributed a major part to the building of this beautiful park. the defended, protected and preserved our nation's natural resources for all generation to enjoy. The CCC was organized by the federal government during the The Great Depression to provide useful employment for thousands of citizens and to develop and save the Nations natural resources. Under management of U.S. Army personnel, they built roads and nurseries, landscaped parks, planted trees, and conserved the countryside. For their work they were paid $30 per month of which $25 was sent home. They also received housing, food, medical and dental care as well as educational benefits. In grateful recognition of their service, this permanent memorial has been presented to CCC Company 808 and its three million members nationwide. Their park serves countless thousands of visitors each year. 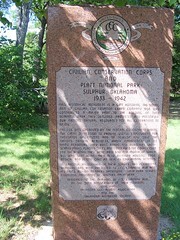 On the 50th anniversary of their founding June 1987 Oklahoma CCC Alumni Association and the Oklahoma Historical Society. Willis Granite Product, Granite, Oklahoma.